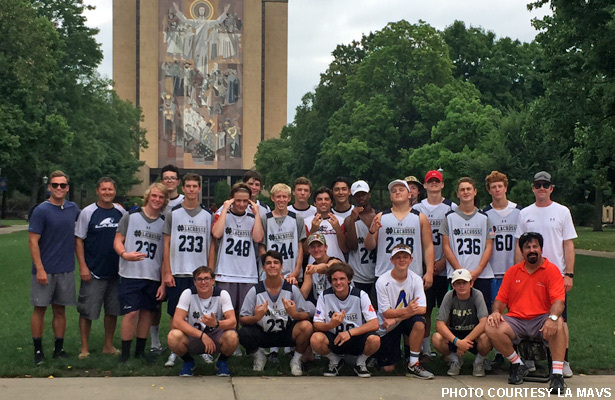 The LA Mavs National squad took third place at the 2016 Irish Recruiting Team Camp last week, winning its pool with a 3-1 record before losing in the semifinals and bouncing back with a come-from-behind win in the third-place game. Five Mavs players were selected to the tournament’s all-star game — Max Manyak (Oak Park 2019), Will Dutton (Thousand Oaks 2017), Marty Shargel (Agoura 2017), Matt Parham (Thousand Oaks 2018) and Sean Richard (Detroit Jesuit 2019) — and Shargel scored a goal in the showcase, but the game was cut short by thunderstorms. The Mavs’ one pool-play loss and their semifinal loss both came against Carmel (Indiana), which has reached the Indiana state high school title game in six consecutive seasons. Carmel won the state title in 2011, 2012, 2014 and 2015 and finished runners-up in 2013 and 2016. In pool play, Carmel got five goals from rising junior attack Chad Kittaka and limited the Mavs’ offense with a strong defense behind rising senior and Hobart commit Kaleb Boyl to win 7-4. In the semifinal rematch, though, Casey Hoops (Oak Park 2018) held Kittaka scoreless and Parham won more than half his face-offs. The result was more offense for the Mavs overall, but Carmel capitalized on a number of man-up opportunities to post an 11-8 win. In the third-place game, played immediately following the semifinal loss, the Mavs started slowly against Team Navy and found themselves trailing 5-0 at halftime. But Manyak got the Mavs’ offense started in the second half, sparking a 6-0 run and a 6-5 victory as the defense blanked Navy in the second half. Max Bulko (Oak Park 2017) scored the game-winner on a feed from Bryce Hardy (Oak Park 2018). Will Dutton, Matt Parham, Marty Shargel, Sean Richard and Max Manyak made the all-star game. The LA Mavs National roster consisted almost entirely of players from the Conejo Valley and LA areas, with three players joining from outside the area. Agoura coaches Sean Lindsay and Zorzi, along with Oak Park’s Tarik Ergin and Oaks Christian’s Geoff Sebold coached the group. The Mavs opened the tournament with an 8-7 overtime win over Illinois-St. Viator, which finished third in its state high-school tournament last spring. Tyler Bradbury (Oak Park 2019) scored the game-winner off an assist from Shargel. Dutton, Shargel, Manyak and Robbie McInerney (Newbury Park 2017) also scored for the Mavs. The Mavs never trailed in their second game, an 11-6 win over the Michigan Warhawks. Hardy scored first, and Bulko, McInerney, Bradbury and Shargel also scored. Parham and Torgove dominated face-offs. The squad moved to 3-0 with a 12-5 win over Team Total U19 (Wixom, Michigan), sparked by a coast-to-coast clear and goal from defender Zack Boyle (Calabasas 2018). Once again, Parham and Torgove handled the face-off dot, and Bradbury, Shargel and Manyak capitalized on offense. Attacks: Bulko, McInerney, Bradbury and Zach Tripp (Agoura 2019). Middies: Dutton, Shargel, Hardy, Manyak, Sultan Daniels (Harvard Westlake 2019), Tyler Whitney (Agoura 2019), Trevor Callahan (Detroit Country Day 2019), LSM/F-O Ian Achuff (Foothill-Pleasanton 2017) and LSM Parker Nolan (Royal 2017). Defenders: Boyle, Hoops, Jordan Broussard (Oak Park 2018), Joey Rosen (Oak Park 2019) and Sebastian Bernt (Agoura 2019).